Video is undeniably the primary way of communicating online. From solopreneurs to Fortune 500 companies – everybody is using videos to showcase their products and services, reach larger audiences and increase user engagement. Almost 5 billion videos are watched on Youtube every single day, and on Facebook the average daily video views are over 8 billion. Video remains, by far, the most valuable and engaging content across social platforms. One third of time spent online is spent watching video! If you are camera shy, use image-based videos, text-based videos or animation to boost user engaegemnt with your ads, your social pages, your products and your website in general. Creating videos on your own has never been easier. However, each video platform draws different audiences with different needs and expectations, and each uses different algorithms to decide what gets seen. You have a unique story to tell so what are you waiting for? 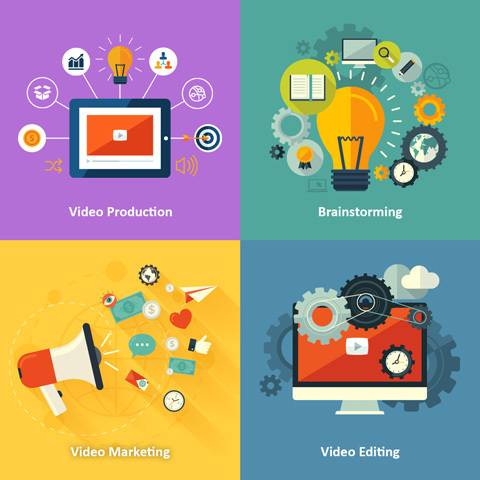 Set your organization apart from the competition with an attention-grabbing video marketing strategy. You need to make a statement if you expect anyone to stick around for more than a few seconds. Video creates a new experience that reaches your target audience faster. Using the word ‘video’ in your email subject lines boosts CTR by 60%, and a homepage video is 45% more likely to get clicked than a text link. Our creative team will help you design and produce attractive and affordable videos, while our marketing experts will craft compelling and engageing copy for your core message, ad text, product description or brand awareness. Logo animations are great as a branded intro to your videos on Youtube and Facebook. These effective “attention grabbers” will upgrade any video. Video marketing is increasing by 130% every year. When combining mobile and social media, video is unbeatable. Video ads are more appealing and engaging than image ads, and play a critical role in the purchase process. Video has proven to be the best way to introduce your products and services. A short and engaging video can inform, instruct and inspire leads, and decrease customer support. Need an experienced team to produce engaging videos for your brand, products or ads?